WASHINGTON (AP) — Thirty-eight Cuban migrants caught trying to sail to the U.S. are stranded aboard a U.S. Coast Guard vessel, waiting for permission from the Cuban government to return home, The Associated Press has learned. The would-be immigrants had tourist visas to the Caribbean island nation of Saint Lucia when they were intercepted at sea by the Coast Guard, U.S. officials said. The Cuban government has refused re-entry to island because their return does not comport with a repatriation agreement with the U.S., one official said. The officials spoke on condition of anonymity because they were not authorized to publicly discuss details of the situation. 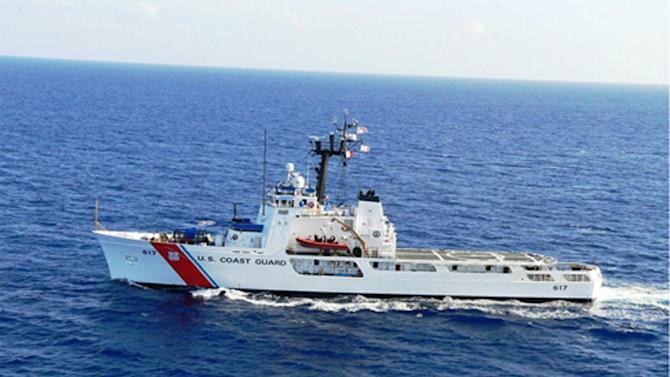 The migrants were among about 96 Cubans who were intercepted at sea and taken aboard the Coast Guard cutter Vigilant, a 210-foot (64 meter) ship operating out of Port Canaveral, Florida. The ship typically carries 75 officers and crew. The Cuban government allowed the return of the other 58 people. Under U.S. law, Cuban nationals who make it onto U.S. soil are granted permission to come into the country and can quickly become legal permanent residents and eventually U.S. citizens. Migrants caught at sea generally are sent back to Cuba. The Cuban government has historically allowed U.S. authorities to quickly repatriate those migrants caught at sea. The migrants were found near the Virgin Islands in late April and have been aboard the Vigilant in international waters since, one of the officials said. The so-called wet-foot-dry-foot policy has long angered Cuba's communist leaders who have argued that the policy encourages Cuban citizens to make the treacherous trip across the Florida Straits, often on homemade rafts or rickety boats in hopes of landing on U.S. soil. In recent years, the Cuban government under President Raul Castro has made it easier for Cubans to travel overseas by eliminating a decades-old and unpopular exit visa requirement. The decision to keep the migrants from returning is likely to cause a diplomatic rift as both governments have been negotiating conditions for re-establishing diplomatic relations. Presidents Barack Obama and Raul Castro announced the effort in December. The United States and Cuba are trying to wrap up an agreement in the coming days that would allow them to re-establish embassies and post ambassadors to each other's capitals after a half-century interruption. Officials from both governments were planning to meet in Havana Friday to discuss the situation. Roberta Jacobson, the top U.S. diplomat for Latin America, will meet Josefina Vidal, her Cuban counterpart, next week in Washington. The biggest obstacle to restoring full diplomatic relations is almost gone: the U.S. designation of Cuba as a state sponsor of terrorism. Obama announced his intention last month to delist Cuba, and the change will become effective May 29, when a 45-day waiting period expires. The designation has ramifications for Cuban access to international financial institutions. Lingering matters include the ability of U.S. diplomats to travel freely in Cuba and speak with dissidents. Ironically, migration has been one of the issues that American and Cuban officials say they've had the greatest cooperation on. HAVANA – Cuba says it will allow the U.S. to repatriate 38 migrants stuck aboard a Coast Guard vessel. U.S. authorities detained the migrants at sea as they headed toward the United States. Those migrants would ordinarily be quickly sent back to Cuba under an existing agreement intended to discourage sea crossings. But U.S. officials said Cuba balked because the migrants had tourist visas issued by the Caribbean nation of St. Lucia and thus were not covered by the agreement. Cuba now says it was only analyzing the situation. The government said Saturday it will make an exception and allow the repatriation. Cubans who make it to the U.S. can qualify for residency, which has prompted many to travel to third countries in hopes of finding another way to reach the U.S.